Napoleon had chosen Leipzig as his central position to defeat the widely separated Allied armies as they advanced to give battle. His first target was the Army of Bohemia advancing from the south. Early on the 16th, Napoleon had ordered Marmont’s Corps to join him at Wachau to provide the needed numerical superiority. Later in the day, General Drouot’s grand battery had destroyed two Russian divisions, opening the gap for a crushing final attack, but Marmont’s corps had not arrived. The reason – Blücher, Napoleon’s implacable enemy, had advanced from the north more quickly than anticipated, and the arrival of Blücher’s advanced guard required Marmont to turn back to face the approaching Prussians and Russians. 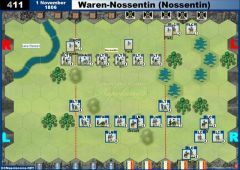 The French had drawn up between Möckern and Podelwitz, when Blücher decided to go on the offensive. Langeron’s Russians were ordered to move forward on Gross and Klein Wiederitzsch. Dombrowski’s Poles were already in possession of the both villages when the Russian columns advanced. The Russians greatly outnumbered the Poles, but many of the Poles were veterans of years of combat in Spain. The Poles, fighting fiercely from within the village houses, stopped the first advance, and then counterattacked effectively. A larger second Russian advance took Gross Wiederitzsch, but the Poles, aided by the timely arrival of Delmas’ division, retook the village and the nearby Birkenholz Wood. 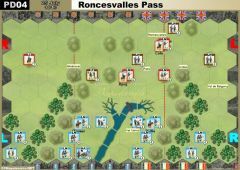 Hoping for a breakthrough, Langeron had ordered his Russian cavalry to charge, but a counter charge by the Polish and French cavalry also sent the Russian cavalry to the rear. Late in the day, Delmas was forced out of the wood, and one final massive Russian push forced the outnumbered Poles to abandon the villages and retire to Eutritzsch. 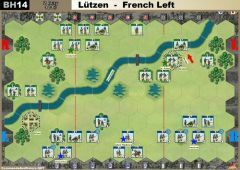 • The Allied player receives 1 Victory Banner for every 2 units, excluding Cossacks, that exit the battlefield from any hex on the French baseline. 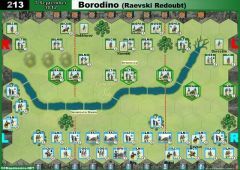 • The Stream has no battle restrictions, but stops movement and will break a cavalry charge. 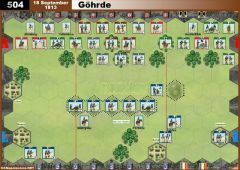 This means a cavalry unit ordered by a Charge Command card will not gain the additional die listed on the Charge card. 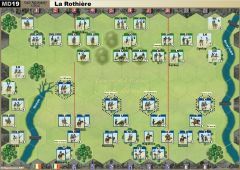 This applies to a cavalry unit moving onto the stream, a cavalry unit that starts the turn on the stream, or a cavalry unit that is on a breakthrough. • Pre-Battle Mother Russia Roll is in effect. Saber rolls have no effect. The objective Victory conditions are a little bit unclear, how many hexes must be occupied and how many VP the players get. 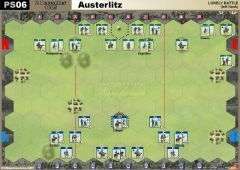 - The Allied Player gains 1 Temporary Victory Banner at the start of the turn for each town hex of Gross Wiederitzsch and Kline Wiederitzsch. The Allied Player can possibly gain three Victory Banners if all three town hexes are occupied. 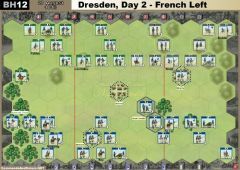 - The French player gains 1 Temporary Victory Banner when no Allied units occupy any of the three town hexes of Gross Wiederitzsch and Kline. The French player starts with 1 Banner. The most the French player can gain is 1 Banner. Note, this Temporary banner can be gained and lost immediately during a turn. We've been playing it and French player won both games by 10/2. 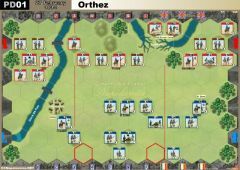 In the 1st one, French had 3 "Cavalry charge" cards in his hands, so it was very difficult to resist. 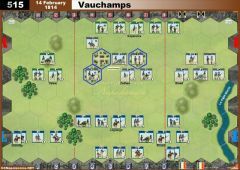 During the 2nd game, Cavalry made its job more slowly but efficiently. And the both french players had good dices too. 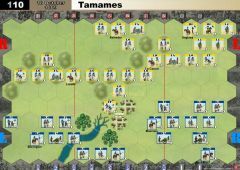 I think that's it very hard to win with the Russian side, especially regarding the weakness of the infantry (no Grenadiers or Elite units). Just finished a interested and close game with Mark (Russian side). and this was my last chance. 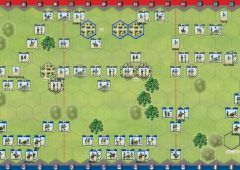 With some tactical moves to save the french units on their weak left and / Center/left section, i could win finally the game 10:8.